Layers of melty chocolate, coconut & fresh banana held together with a sweet & creamy peanut butter drizzle. Incredibly addictive but barely 100 calories! As a little girl, I almost always asked my dad to make my peanut butter sandwiches. I wanted mine to be just like his: soft yet hearty whole wheat bread with an extremely thick layer of peanut butter slathered in between. Dad spread on so much peanut butter—close to ½” thick—that it nearly glued my mouth shut every time! Unlike the kids at school, I liked my peanut butter sandwiches plain. No jelly, no jam, just pure creamy peanut butter. As much as I adored strawberry jam in my thumbprint cookies, it turned my PB sandwiches soggy by the time the lunch bell rang, which resulted in a gloppy, sticky mess. Not fun! Love at first bite. No wonder Elvis loved that combo so much! 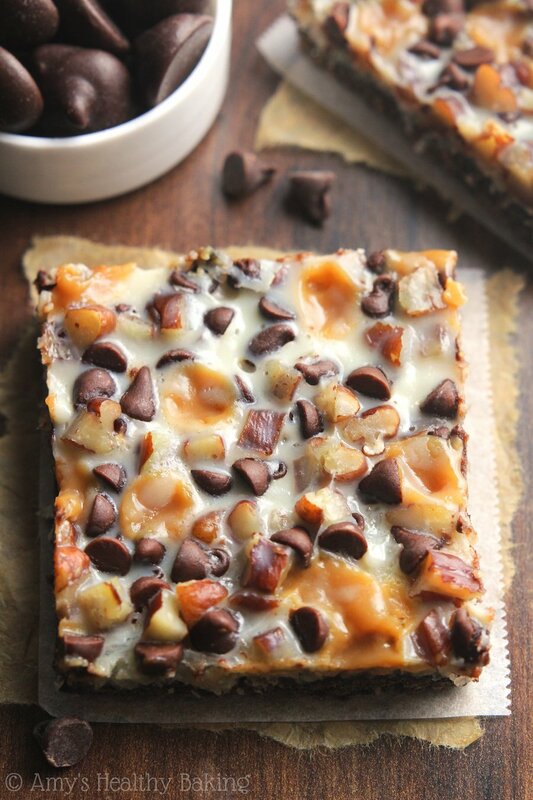 So that’s the inspiration for today’s recipe: Skinny Peanut Butter Banana Seven Layer Bars! 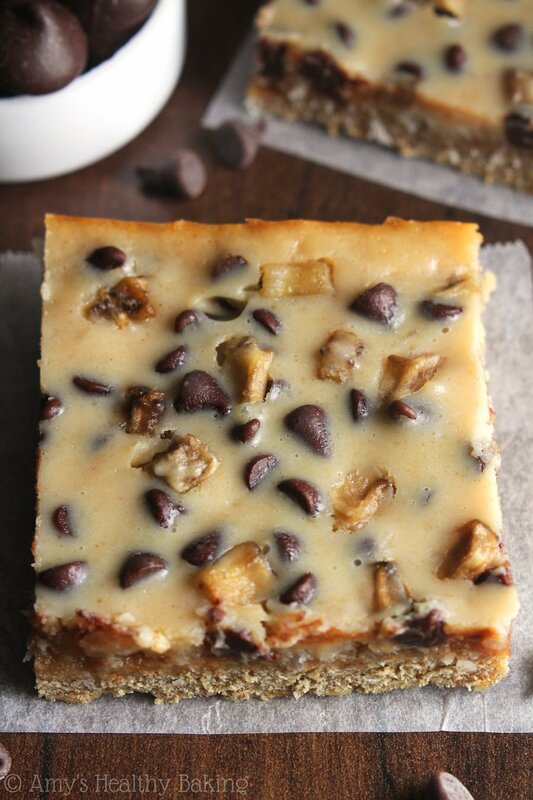 Ooey, gooey, sweet, nutty, soft, chewy… This is the stuff dreams are made of. Especially when those dreams are barely 100 calories! 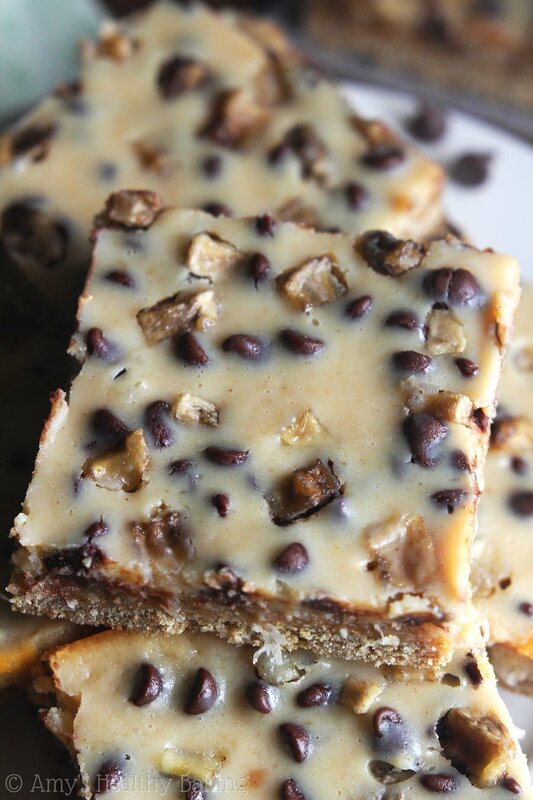 If you’re new to AHB or missed my last seven layer bar recipe, let’s talk a little bit about how these are made. Classic seven layer bars (aka “magic” bars) consist of—you guessed it!—seven ingredients all layered together in a pan. And those are graham crackers, butter, shredded coconut, chocolate chips, butterscotch morsels, nuts, and sweetened condensed milk. That makes for quite a delicious mouthful—and a whole lot of calories! So to lighten these up, I made a few simple swaps. Egg whites are substituted for the butter to hold the graham cracker crumbs together. That cuts down on a whole lot of calories and adds a little extra protein too! I switched to unsweetened coconut to shave off a few more calories, and we’ll use a little less than the traditional recipe calls for. Finally, Greek yogurt and Truvia are substituted for half of the sweetened condensed milk. Another protein boost and fewer calories from sugar! The peanut butter is mixed in with the sweetened condensed milk, Greek yogurt, and Truvia. 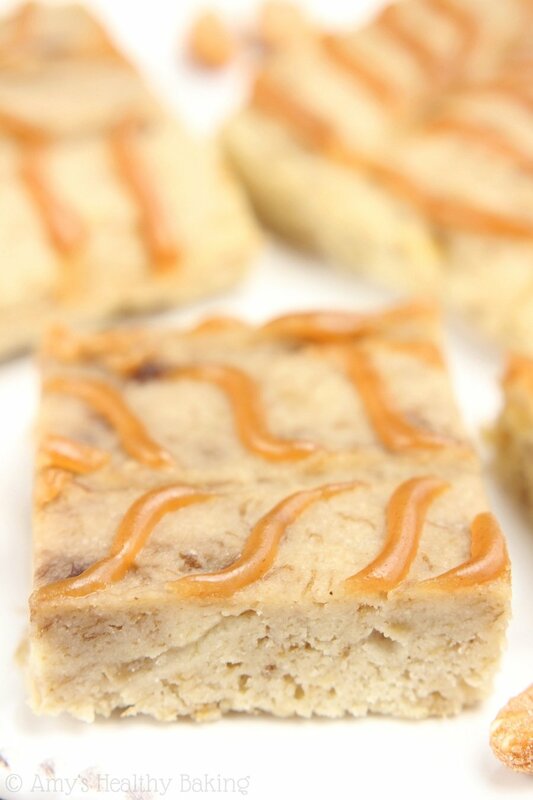 Drizzled over the rest of the ingredients, it adds the perfect nutty and sweet finishing touch to the bars. It’s nearly impossible to resist eating that mixture straight from the bowl with a spoon… And if you figure out how, tell me your secret! Baked until golden, cooled until set, and sliced to serve… These beauties are a dessert to behold. And eat. And sneak seconds and thirds when nobody’s watching. But I wouldn’t know anything about that, of course! 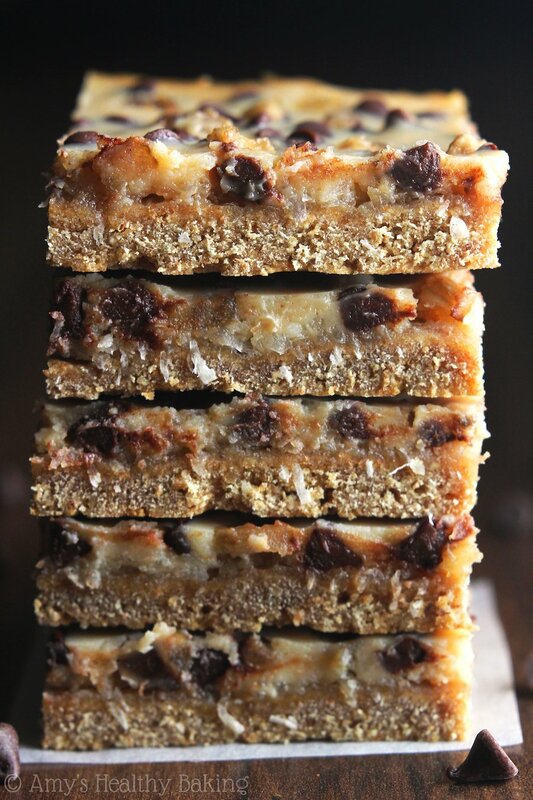 A fun twist on the classic seven layer “magic” bars! Sweet, fruity, nutty, and chocolaty, these treats are bound to disappear quickly. For any that don’t, store them in an airtight container in the refrigerator for up to 5 days. Break the graham crackers into pieces, and add to a food processor or blender. Pulse until they resemble fine crumbs. Transfer the crumbs to a bowl, and add the egg whites. Mix together until fully incorporated. Press into the bottom of the prepared pan. 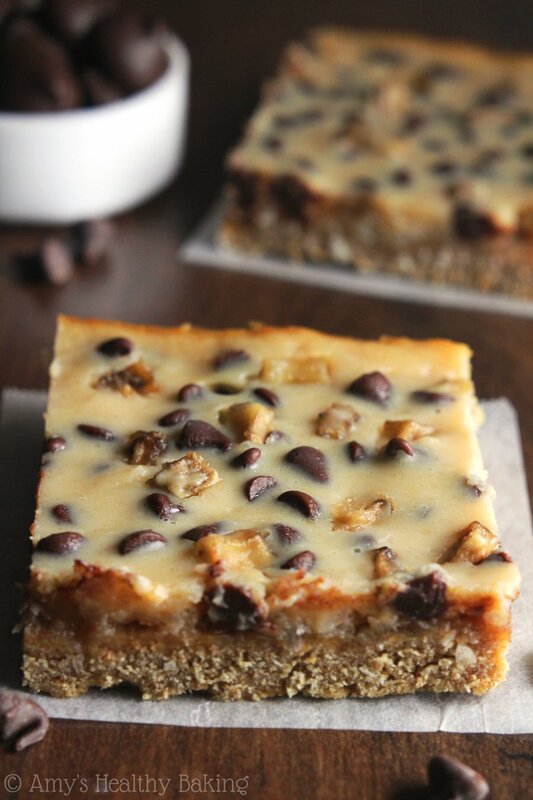 Sprinkle the coconut, chocolate chips, and diced banana over the graham cracker crust in that order. In a small bowl, stir together the sweetened condensed milk, Greek yogurt, Truvia, and peanut butter. Drizzle over the top. Bake at 350°F for 17-20 minutes. Cool completely to room temperature, and allow the bars to set once they reach room temperature for at least 3 hours before slicing into squares. Notes: If you do not have Truvia, substitute 1 tablespoon of sugar (or the equivalent of your favorite no-calorie sweetener). If running short on time, thinly sliced the banana into rounds instead of dicing. Layer the banana slices directly on top of the crust before sprinkling the coconut. Oh my! These look so luxurious! I had my pb sandwiches the same as you in school – I couldn’t understand why anyone would put jam in theirs! 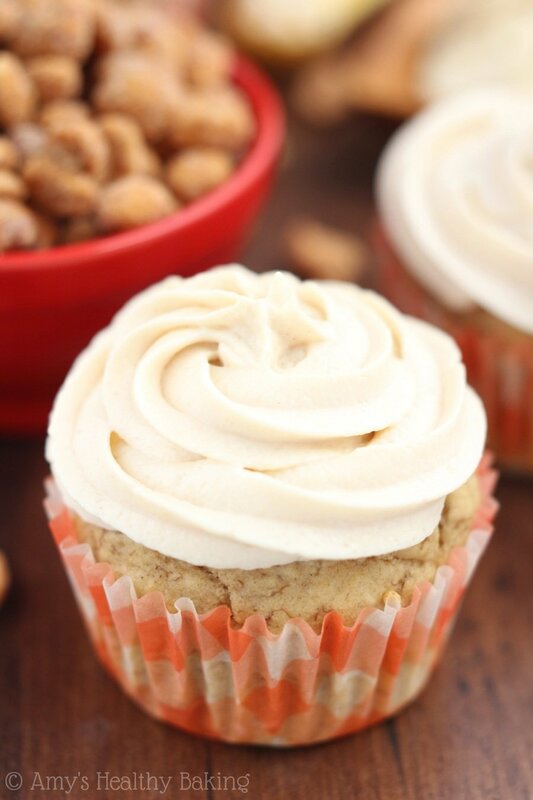 I am completely in love with the Elvis combo – a sweet banana and the salty pb is just perfect, pinned! Thanks for your kind words and pin Eve! I’m still the same way — no jam in mine! I’m so glad you enjoyed them Andrea! I have the best taste tester in the world. ♥ We’re two peas in a pod! Loving this combo and the healthy substitutions you made. Can’t wait to try them! Thanks Kristen! I hope you enjoy them! I’m so glad you enjoyed them! Chocolate PB2 sounds incredible — I’ll have to give that a try! Dissapointed when I saw the first ingredient was 10 sheets of graham crackers. What a cop out. I never eat white flour, always replacing baking with whole wheat, but when that’s not possible because the recipe calls for some sort of cracker or cake mix I’m always disappointed. I think that’s the lazy way out. 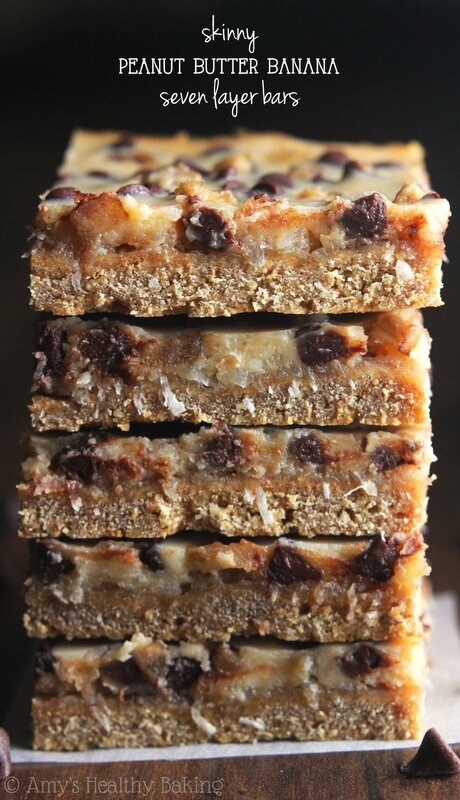 Those 7-layer “magic” bars are a fave, but so fattening! I LOVE your version! Great flavors and even better since they’re 100 calories (wow!! )!